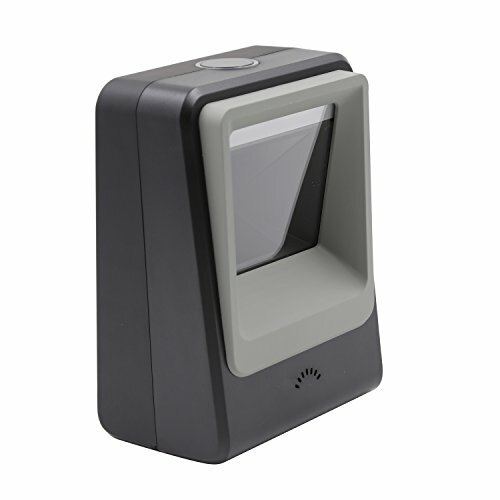 This Wired Hands-free barcode scanner doesn't need any driver, it is compatible for Windows,Linux and other systems. 1D: EAN-8, EAN-13, Codabar, CODE 39, CODE 93, CODE 128, China Post, GS1-128, UPC-A, UPC-E, ISBN/ISSN, ISBT , Interleaved 2 of 5, Standard 2 of 5, Matrix 2 of 5?Industrial 2 of 5 , MSI, RSS, ITF14, Telepen, etc. 2D: QR Code, Micro QR Code, Data Matrix, PDF417, Micro PDF417, Maxicode, Aztec, Hanxin, etc. With a very large target area(65*60mm, 1.95*1.8inch), the scanner can read barcodes very fast, it can easily capture bar codes 1D, 2D on labels, paper, and mobile phone or computer displays,Sensitive and accurately. Handsfree and Auto-sense Scan Design: No need to carry the scanner, cashier can free two hands to grab goods. USB interface, plug and play, very easy to use. No need to install any software or drivers. You can press the button on top of the scanner platform to switch between Normal scanning mode and 1D fast scanning mode according to your working situation. With its fashionable design, it will brighten your working desk. CMOS Optical Imaging Scanning Technology: Which can identify screen code, incomplete code and fuzzy code etc.